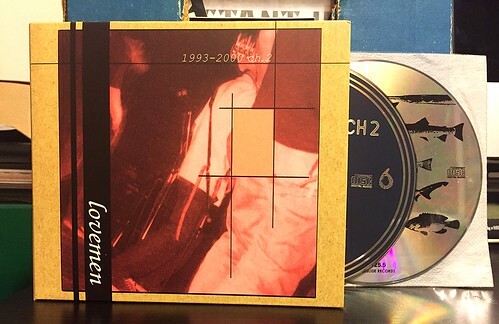 Today we have the companion release to yesterday's Lovemen CD. Chapter two includes a lot of my very favorite Lovemen songs including the songs from their split 7"s with Hooton 3 Car, Eversor, Servo, The Tone, a couple of compilations as well as my favorite of their full lengths, Children Eat a Nightmare. Also included as a bonus disc is Lovemen's second demo tape along with a song from a cassette only compilation. As with chapter one, I have owned the vast majority of these songs for quite a few years. The split 7"s are the records that got me interested in Lovemen originally and Children Eat a Nightmare is perhaps one of the best albums that Snuffy Smile had ever released. Like everything from yesterday's CD, these records have been out of print forever, so it's so great to have these songs all compiled and available again on Waterslide records. As far as the songs go, this is a masterclass in melodic punk rock. Lovemen were very much inspired by the Snuffs, Leatherfaces and Mega City Fours of the day, but I never felt like Lovemen was trying to sound like one of these bands. They took these influences and crafted something that was unique to them. That along with the ability to unleash so much energy into their songs, regardless of how fast or how slow they are playing is what always drew me to this band. I just want to ball my fist up, throw it in the air and shout along to everything coming out of my speakers. Listening to all of these songs together, especially the 7" songs which I admittedly haven't played in quite some time, it really struck me just how amazing this band really is. Just like with chapter one yesterday, this is just an essential release if you are interested in Japanese punk rock.